Financial Planners: Your divorce financial settlement needs to be more than 50/50 or fair according to the law. It needs to be the best decision for you and your future family, taking into consideration investment priorities as well. We at Peace Talks suggest that you see an accountant or financial planner as part of your divorce. Another source for finding a financial planner would be through the Association of Divorce Financial Plannerswebsite. Their members practice in New York, New Jersey, Connecticut, and Massachusetts. Retirement Plans or 401(k): Pension Appraisers is a national pension appraisal and Qualified Domestic Relations Order (QDRO) drafting firm. For a reasonable cost, they can do a pension appraisal or draft your QDRO paperwork. Diana has been using them since 1988, and they have always been reliable. Asset Searches: Many asset searches charge a fee for their services. Be sure to inquire about the fees prior to utilizing such services. Because online businesses are difficult to monitor, be very wary. 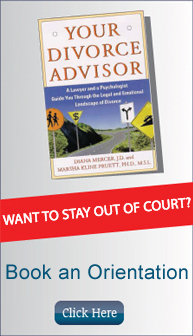 Neither the authors nor the publisher of Your Divorce Advisor endorse or encourage the use of such services. If you decide to use a service and would like to provide feedback (positive or negative), we’d love to include it on our site. If you have other suggestions for sites you’ve used, we’d love to hear them. E-mail us at mediator[at]peace-talks.com. Peace Talks can handle your estate planning needs. www.estateplanningmediation.com. Give us a call (310) 301-2100 or email us at mediator[at]peace-talks.com. Get a referral to a qualified estate planning lawyer at the official web site of the American College of Trust and Estate Counsel. Double check your pick at Lawyers.com to see if she or he is listed with Martindale Hubbell, the leading publisher of legal directories. Lawyers are listed by geographical area and specialty. Don’t forget Nolo Press’s do-it-yourself estate planning kits and information.